You are invited to submit an abstract of a formal paper to be considered for presentation at the conference. Abstracts are welcomed from bridge design engineers; consultants; fabricators; erectors; precasters; construction professionals; maintenance engineers; transportation officials; policy makers; marketing professionals; federal, state, and local agencies; city, county, and regional officials; industry suppliers; academicians; and bridge professionals with any aspect of bridge design, construction, or maintenance. Those interested in giving a presentation at the conference should submit a one-page abstract by Jan 18, 2019. 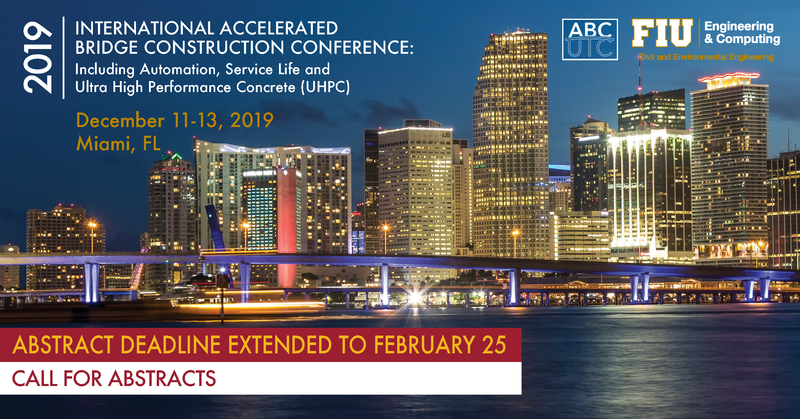 Abstracts must be submitted online at https://abc-utc.fiu.edu/conference/abstract-submission/. The authors of abstracts selected for presentation will have the option of submitting an extended abstract (minimum of 3 pages) or a full paper (maximum of 10 pages) for inclusion in the conference proceeding.